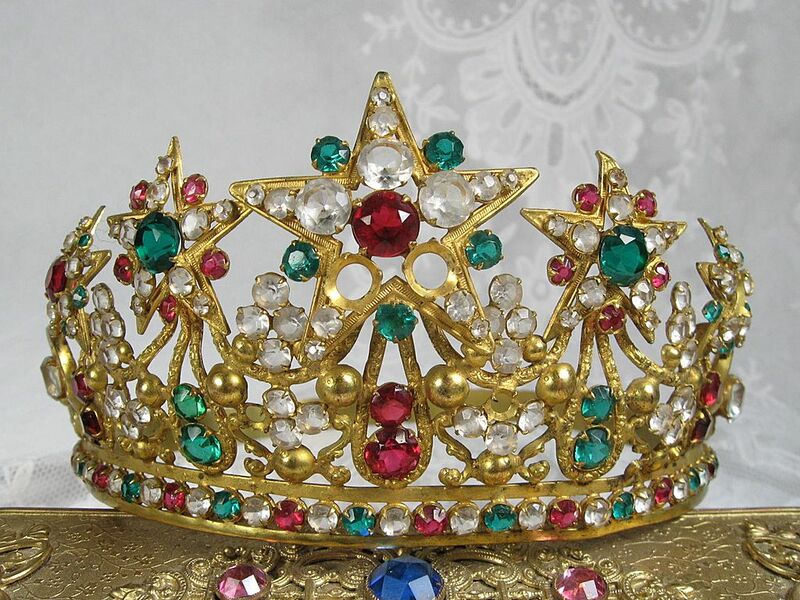 Breathtaking antique French tiara or crown for a Madonna or Santos. This crown comes to you direct from France. This tiara is just precious, dates to the mid to late 1800s and is loaded with open back paste glass colored stones, clear, green and red. The metal is a gilt brass ormolu with five stars at the top area, a large star in the center with two graduated stars on each side. The stars are graduate with ornate detail throughout the tiara. The tiara is adjustable. There is five stones missing of which can be replaced or just left as it is. There is so many stones in the tiara that the missing stones are not readily apparent and the price reflects the missing stones. A full size crown perfect for display or a statue. Measures about 3.25" tall from the top of the large star to the bottom. About 6" across on the smallest adjustable setting.